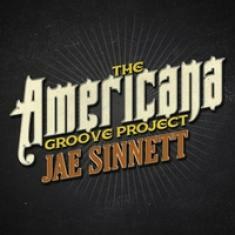 Jae Sinnett is a gifted drummer, composer, and vocalist with a unique feel. On his new album The Americana Groove Project, he explores genres like urban, R&B, and funk, and more importantly, he has a beautifully moving voice. Sinnett's singing is like a bridge to and from the soul. His evocative vocal skills are incredibly dynamic, reaching deep within the heart of the listener. His voice certainly makes The Americana Groove Project stand out as an extremely enticing example of his talent. This music is uplifting, and it is the kind of album that has the power to immediately cast a positive effect on a listener's mood. In addition to Sinnett's astonishing performance, the production is absolutely spot on. Everything in the mix is falling into place to perfection, making for a really fantastic experience for listeners of all walks of life. Ultimately, you're going to love this if you are a fan of artists like Stevie Wonder, Ray Charles, or even John Legend, only to mention some. Sinnett is arguably a very well-rounded artist with a rich personality, and a magnetic presence; it's a perfect mirror of his electrifying character.